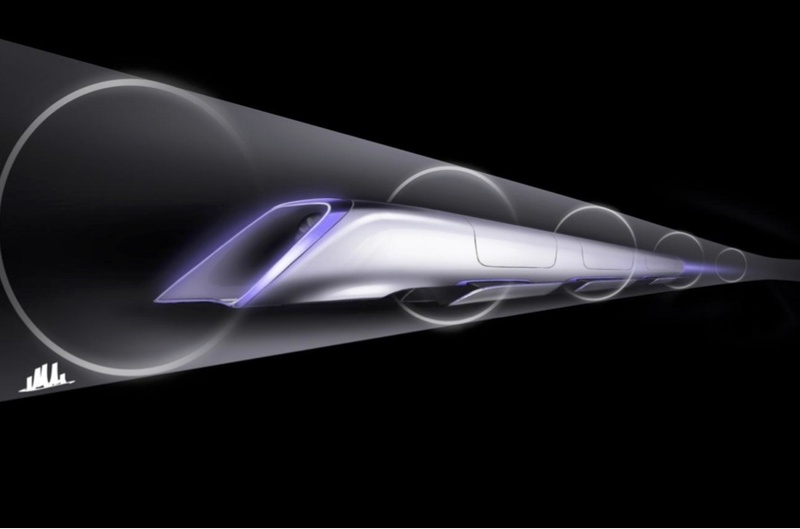 Future Long-distance Transportation: Trains versus Hyperloop? 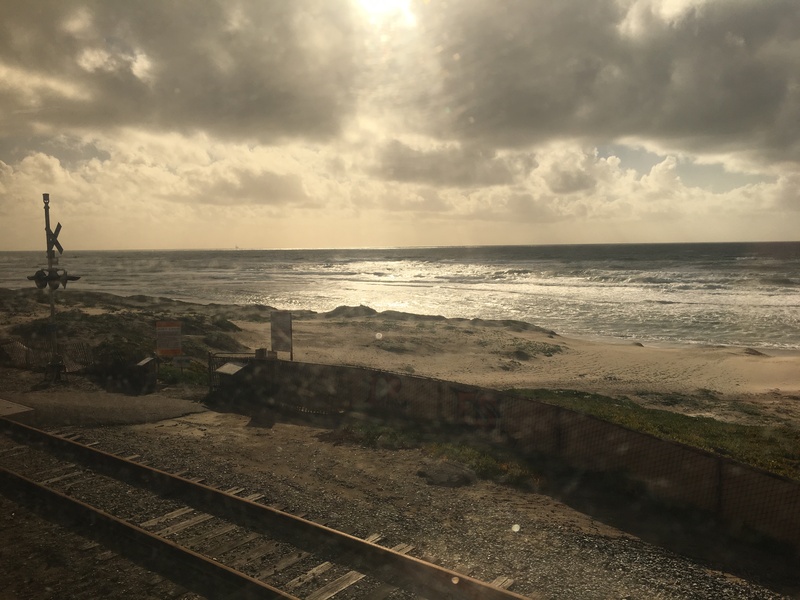 As I rode Amtrak trains up the scenic California coast from San Diego toward Santa Cruz, I wondered about what long-distance travel here might look like in a couple decades. Will “car culture” prevail, as gas guzzlers, hybrids, and growing fleets of self-driving cars jam the highways criss-crossing Western United States? Or will airplane flights become increasingly popular and uncomfortable? Or as climate change begins to hit home and droughts heat up, will people try to avoid these greenhouse gas-emitting (and federally subsidized) modes of transportation and even avoid long trips altogether? 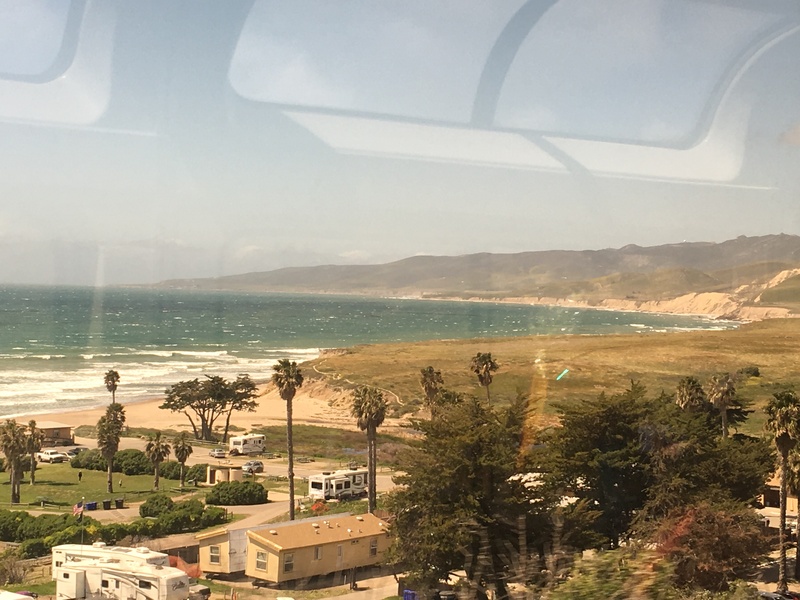 I took this photo from my comfortable window seat on Amtrak’s Pacific Surfliner train. Of course, airplanes and automobiles aren’t the only game in town. Many people frequently take trains between southern California and the Bay Area, and the trains yesterday were full of people heading north. It currently takes ten hours to traverse the distance from Los Angeles to the Bay Area, and if the state’s high-speed rail is completed according to plan, by 2029 one could make the trip in sleek bullet trains in just two and a half hours. Here’s another photo, this time from the observation car of Amtrak’s Coast Starlight train. On the other hand, Elon Musk, CEO of SpaceX and Tesla Motors, has popularized the Hyperloop concept. This system would hurl groups of two dozen people at faster airplane-like speeds in low-pressure tubes—like the old pneumatic tubes used by banks (and human-sized tubes in the Futurama cartoon)—in as little as one fifth the time of high-speed trains. Engineers could be building the first Hyperloop pods well before the final tracks in California are laid. High-speed rail, the Hyperloop, and self-driving cars all have their advantages and shortcomings, but my feeling is that trains will be the way to go, at least until the 2040s. I may be biased, as I’m a big fan of trains. But let’s consider the issues of practicality, budgets, and timelines. Conceptual design rendering of a Hyperloop capsule (Credit: SpaceX). The necessary technology for high-speed rail is already available. American engineers could build on the innovations of European, Japanese and Chinese train systems. It will be difficult to cross some mountainous areas in Southern California, but if the Hyperloop comes to pass, it will be built through a similar corridor and will face similar challenges. But engineers don’t really know how the Hyperloop could work yet, either like expensive Maglev (magnetic levitation) technology or floating on pressurized air like air hockey pucks, and many years of testing remain. They don’t even know where they might build the first Hyperloop either; it might come to Slovakia before California. The high-speed rail project has notoriously gone over budget, as it’s now at $68 billion, twice original estimates. Legal and political disputes have plagued it as well. (Furthermore, Southern California lost out when state authorities recently decided to build the first segment of the route from San Jose, rather than Burbank, to the Central Valley.) But the Hyperloop concept is still in its early stages, and its budget estimate of only $6 billion is wildly unrealistic and has been rightly criticized by economists. High-speed rail has dropped behind schedule, but now that people are actually in the process of building it, I think it will be completed near the current timeline, within 15 years. (It reminds me of the James Webb Space Telescope, which experienced many budget overruns and delays, but now NASA’s sticking to its final larger budget and launch date of 2018.) If the Hyperloop, on the other hand, were shown to be successful elsewhere, it’s hard to imagine Musk or someone else even starting to build it in California before then. The technologies involved in developing self-driving cars, either for taxis or personal use, are farther along than the Hyperloop, but they’re not ready yet. Scientists predicted last year that, like trains and the Hyperloop, self-driving cars could drastically reduce greenhouse gas emissions. But these estimates assume that many Americans will jump on board these smaller vehicles and trust their software. This study also assumes no “rebound effect,” but if the cars are as good as hyped, it’s reasonable to expect that people would drive more, using more energy than before. 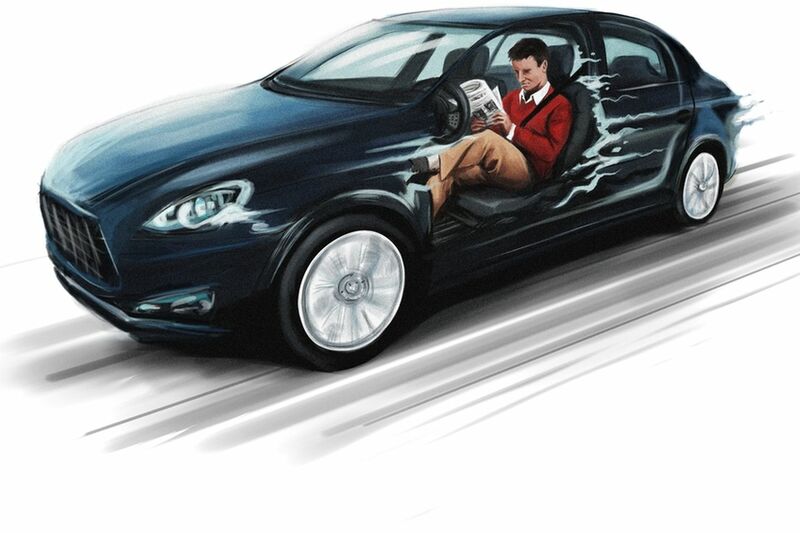 Finally, maybe it’s just me, but self-driving cars seem kind of strangely anti-social. Instead of expending so many resources to build thousands of cars driving in unison on the same highway, wouldn’t it be simpler to design a more efficient public transit system with already available technology? If you really like your car, you can drive it to the train station! “Hyperloop” is a really catchy name. But what is it? As far as anyone knows it has to be Maglev technology combined with near vacuum. And this means look no further: Germany and Japan are the leaders in Maglev technology and the claimed and then projected costs even for shorter routes were so prohibitive that only a single test track ever was built in Germany (which is now closed). There were two plans for Maglev tracks: Berlin-Hamburg, a ~300km long route. Projected travel times were ~60 minutes with top speeds of 450km/h. This was at a time when the train still took 4h. Projected costs were 4.5 bEuros, before any digging was started. Experience shows that one would probably have to double this number to be in any way realistic, specifically for a first-time technology. Note: this was for a basically totally flat route with nearly no obstackles, no mountains of even hills and little infrastructure in the middle. After this project was stopped by the public for cost reasons there was an investment into the train tracks of 700 mEuros and since then the high-speed trains take ~75min for this distance. That would have been 20% time savings with the Maglev for 10 billion Euros. The second route after this was the idea to connect downtown Munich with the airport. Terrible idea, to build a new technology infrastructure route in the middle of a city where there is no space. So costs again exploded and it was scrapped. In the end the “German” Maglev route was build in Shanghai with heavy subsidies by Germany. It apparently runs a substantial deficit each year. Japan is currently building a longer Maglev connection, with planned costs of 40 bEuro for Tokyo-Osaka. So what does this tell us: Maglev tech is very expensive, basically because you have to build train-track like infrastructure and then add a linear motor on the tracks. Is this something you want to combine with near-vacuum technology and hope to get away cheaply? Good luck. No, I don’t think that this is a good idea unless someone can demonstrate that one could build a Hyperloop solely with air-cushening and without Maglev technology. Thanks, those are all good points. I agree: It seems like Maglev technologies turned out to be far more expensive than people expected it to be. It’s not clear to me that they’ve decided yet whether the Hyperloop would use similar technology or whether the pods would levitate on pressurized air like air hockey pucks. As you said, they haven’t proven yet that it would work without Maglev. I’ve gotten a couple comments about self-driving cars, which could shorten commute times and make highways less clogged. If a significant fraction of cars were self-driving ones, and if people didn’t start driving more, I think they could make a difference. We’d benefit from a balanced and multi-pronged approach to transportation. From an environmental and climate perspective though, we need more investment in public transit infrastructure (trains, buses, streetcars) and making cities more bike- and pedestrian-friendly. Self-driving cars could become part of the public transit infrastructure – this is what Uber is aiming at and already testing in Pittsburgh with its self-driving taxis. The danger being of course that our current unsustainable level of car traffic will be converted into an equally unsustainable level of automated cab traffic. Mass transit has the potential for a higher throughput rate, definitely in large conurbations, so should indeed receive preference there. Thanks, I think that’s a good point. We’ll see how self-driving cars fit in; it’s possible they could become part of a sustainable public transit infrastructure, but I’m not sure. I think some people in Pittsburgh (where I lived in the early 2000s) are concerned that the popularity of self-driving cars could distract from much-needed maintenance and support for the existing infrastructure.